The holiday season is officially upon us. Although grocery stores and malls have been playing Christmas music since October, we decided to wait until December to decorate. Evelyn was very curious to see what was in the bins that came down from the attic and took over her play area. 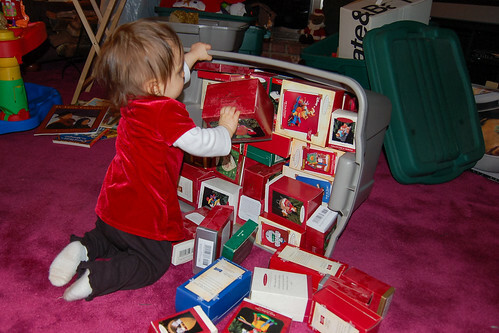 She was anxious to start putting decorations the tree. But first she had to take them out of their bags, bubblewrap, and boxes (yes, for some reason Steph keeps all of the Hallmark ornaments in their original packaging). 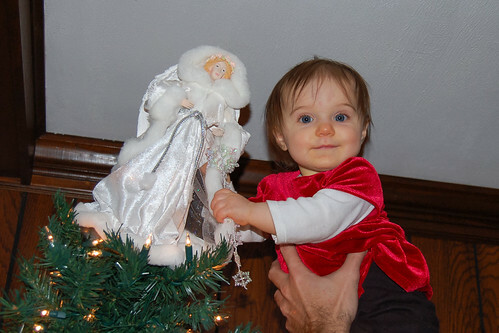 After all 1,463 ornaments were placed on the tree, it was time for our angel to put the angel on the top. 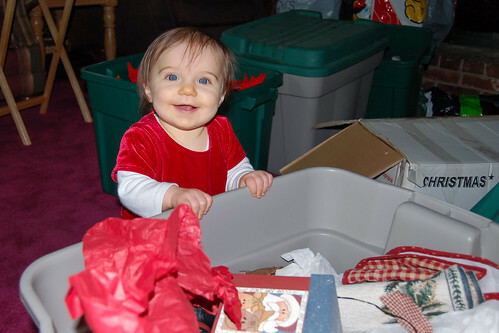 We only hope that she will have as much fun celebrating Christmas as she did getting ready for it. Evelyn seems to be enjoying the season. She certainly had a lot of ornaments to put on the tree. She looks very festive in her red velvet shirt. She is probably one of Santa's elves at work. And what a good job placing the angel. Nice work. And now, for the presents to wrap. Where are those presents, Mom? I can help! She just gets cuter and cuter every time I come here to see your updates. She's totally going to be a heartbreaker, that's for sure. And she always looks SO happy! !